(ARISE magazine, issue 12) Africa is bigger than you think, and software pioneer Kai Krause has produced a map to prove it. 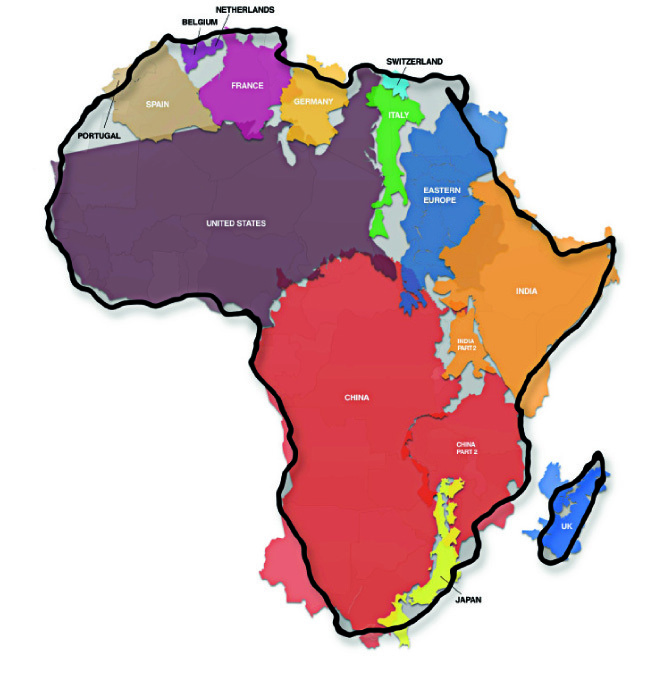 Named The True Size Of Africa, Krause’s representation neatly undermines our preconceptions by demonstrating that Africa is considerably larger than it’s commonly believed to be. In reality, it takes up the same area as the US, China, India – what we think of as the world’s biggest countries – as well as much of Europe, combined. Krause blames our bias, in part, on popular mapping projections, such as the Mercator, which dramatically distort the size of land masses. He even has a phrase for our geographical ignorance: ‘immappancy’ – as in illiteracy or innumeracy – and calls his diagram “a small contribution in the fight against rampant immappancy”. Krause’s map has been criticised for not representing accurately the different countries’ shapes and proportions. However, the calculation was worked out using the area mass of each country (taken from Wikipedia) and comparing the total to that of Africa. As Kai himself points out in the accompanying explanation: “the graphical layout of this map is meant purely as a visualisation… the map purposefully uses the familiar shapes, as if you are ‘moving pieces’ in Google Maps”. Now we just need someone to remind the world that Africa’s a continent, not a country.